Two Tone: Outside color: Please refer all colors for Soft Tulle. Inside color: Please refer all colors for Sequin. V-neck dress with spaghetti straps that beautifully intertwine in the back. 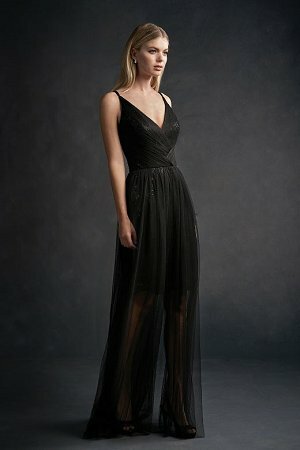 Beautiful, knee length sequin dress with soft tulle overlay that extends into floor length. Detailed ruching to complete the captivating look.